Welcome to a new Legislative Day in the Senate of the Federal Republic of Nigeria. Deputy Senate President, Ike Ekweremadu took the official prayer and led the Senate into today's proceedings at 11:01am. The Senate moved into its Executive Session at 11:04am. 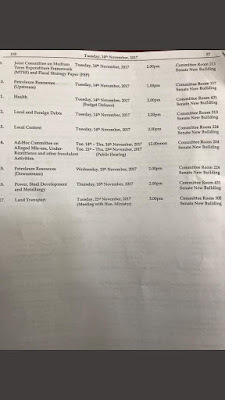 The Senate in its Executive Session deliberated on the workings of the Senate and the National Assembly as a whole and also discussed the suspension of Senator Ali Ndume. He is recalled without prejudice and billed to resume on Wednesday, 15th November, 2017 after 90 legislative days suspension. Senator Dino Melaye moved for the approval of the votes and proceedings of Thursday, 9th November, Senator Danjuma Lar seconded. The Deputy Senate President, Ike Ekweremadu welcomed people who are present in the gallery to observe plenary. Senator Ovie Omo-Agege laid a petition on behalf of members of his constituency on a breach of the public trust with the brazen and illegal conversion of the land of the Uvwie people purportedly acquired for public purposes into private property y some unscrupulous soldiers through the instrumentality of the Nigerian Army Properties Limited. Senator Gershom Bassey laid a petition from a member of his constituency. The petitions were referred to the Committee on Ethics, Petitions and Privileges. Senate Leader, Ahmed Lawan cites Order 42 seeking the permission of the Senate to present a motion tomorrow (Wednesday, 15th November 2017) on the fire outbreak in Nguru market, Yobe State in his constituency which gutted stores with goods worth hundreds of thousands of Naira. Issuance of US$2.5 billion to Finance the 2017 Appropriation Act and US$3.0 billion to refinance domestic debts by Senator Shehu Sani. - That the Senate do receive and consider the Report of the Committee on Local and Foreign Debts on the Issuance of US$2.5 billion to finance the 2017 Appropriation Act and US$3.0 billion to refinance domestic debts. Senator John Enoh seconded that the Report be *LAID* while Senator David Umaru seconded that the report be *PRESENTED*. 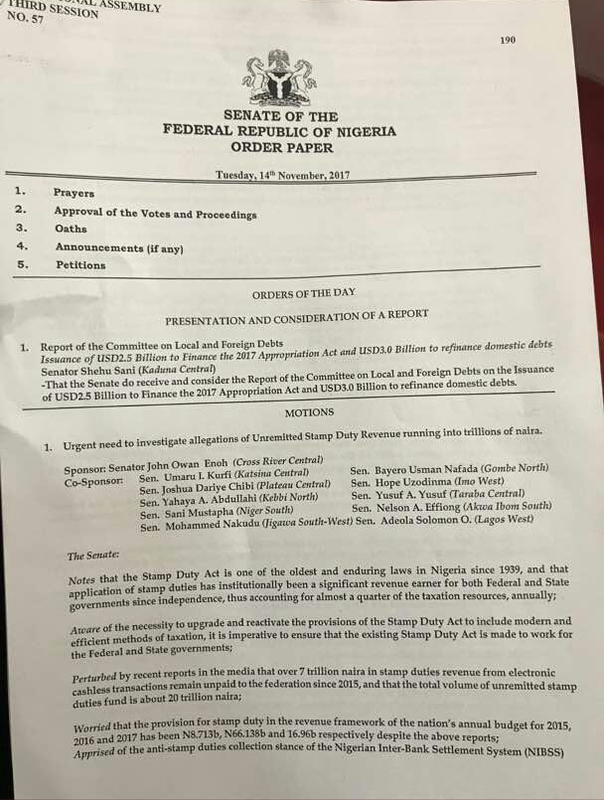 Senator Yusuf A. Yusuf cautions the Senate on piling foreign debt. Senator Gbenga Ashafa said what the loans are meant for will spread across the Geo-Political zones. Senator Mohammed Hassan raised an observation on the title and said it should read ''bond issuance'', he also speaks on the recommendations of the US$2.5 billion bond. The Deputy Senate President, Ike Ekweremadu thanked his colleagues on their contributions and said the Senate will continue to partner with the Federal Governmnt towards making sure that the 2017 Appropriation Act is achieved. 1. Urgent need to investigate allegations of unremitted Stamp Duty Revenue running into trillions of naira. Sponsor: Senator John Owan Enoh (Cross River Central). Senator Suleiman Hunkuyi seconded the motion. ii. 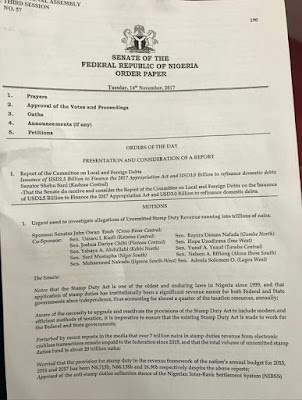 Mandate Committees on Finance and Banking, Insurance and other Financial Institutions to investigate allegations of unremitted Stamp duties Revenue in the last five years, and to report its findings, observations and recommendation to the senate not later than eight weeks from the date of this resolution. 2. The Need for fair and equitable distribution of federal health facilities in all six geo-political zones of the country in response to several demands. 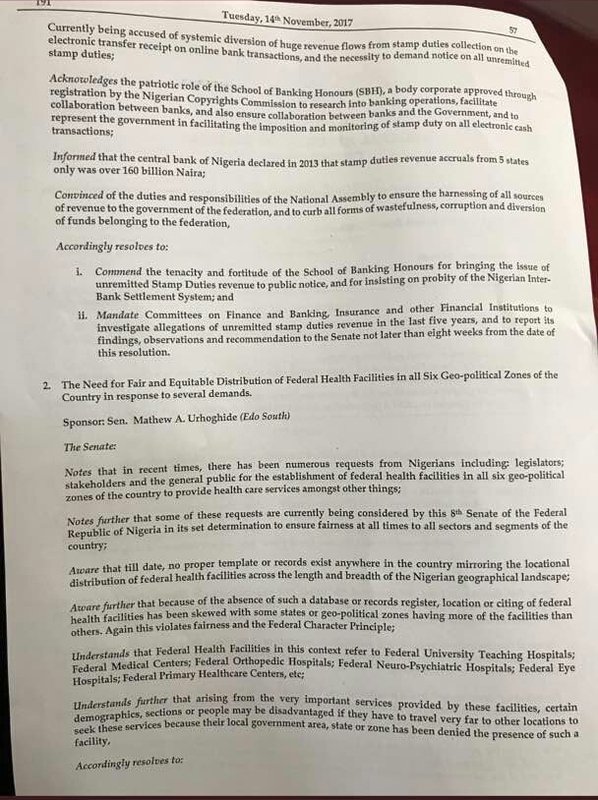 Senator Aliyu Sabi lent his voice to the motion by adding that the senate needs to look at truly disadvantaged areas as regards federal health facilities. Deputy Senate President, Ike Ekweremadu said uncompleted and abandoned health sectors scattered all around the country should be taken over by state government to avoid wasting funds building new ones. ii. 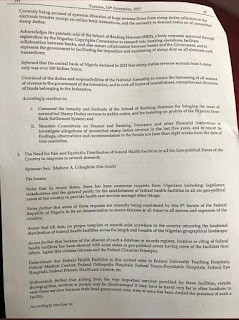 Refer all requests or demands by legislators and other stakeholders for the citing of federal health facilities, where they do not already exist, to this joint committee with the intent and purposes of correcting the imbalance in the distribution of federal health facilities across local government areas, states and or geo-political zones. iii. Mandate the Joint Committee in the tiers of government to work out staff structure in the hospitals. 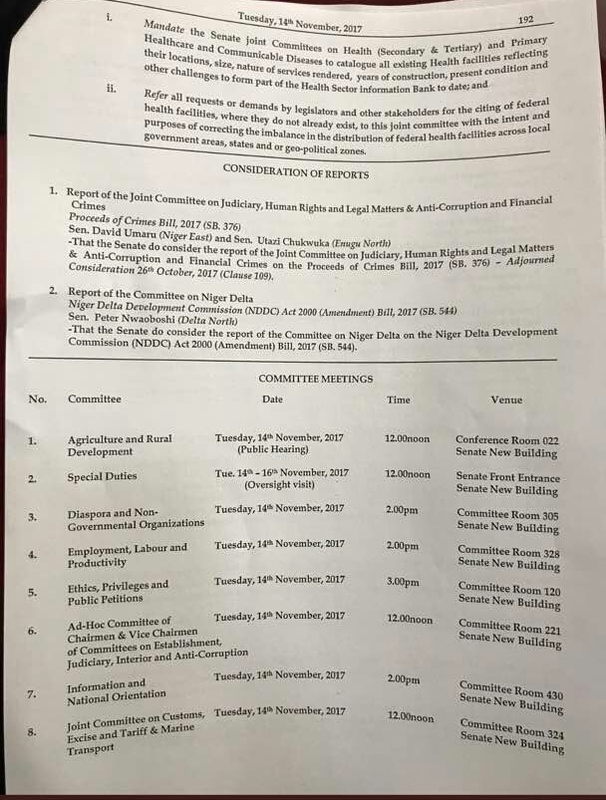 Niger Delta Development Commission (NDDC) Act 2000 (Amendment) Bill, 2017 (SB. 544) by Senator Peter Nwaoboshi. 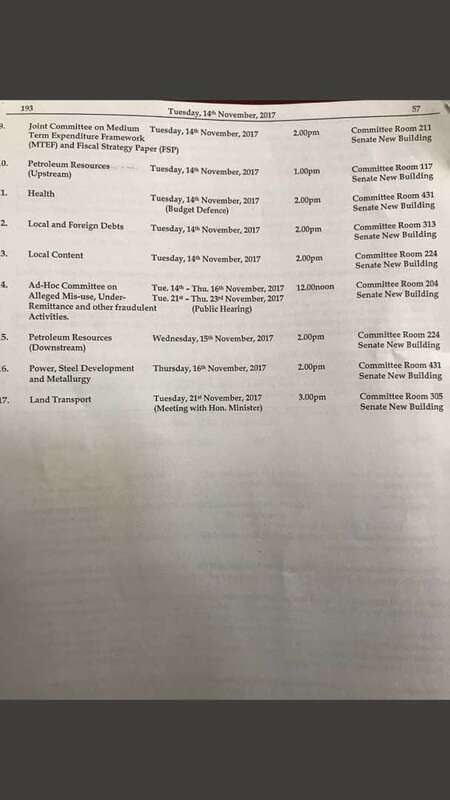 -That the Senate do consider the Report of the Committer on Niger Delta on the Niger Delta Development Commission (NDDC) Act 2000 (Amendment) Bill, 2017 (SB. 544). The senate now dissolves into the Committee of the whole for the clause by clause consideration of the Niger Delta Development Commission (NDDC) Act 2000 (Amendment) Bill, 2017 (SB. 544). The Senate reverts to Plenary to report progress. The Deputy Senate President, Ike Ekweremadu thanks the committee for a prompt presentation and says the constitution empowers us to oversight the MDAs on matters like this. The Niger Delta Development Commission (NDDC) Act 2000 (Amendment) Bill, 2017 (SB. 544) is read the *THIRD TIME* and *PASSED*. The Leader of the Senate moved that other items on the Order paper be stood down to another Legislative day. The Minority Leader seconded. Plenary is adjourned to Wednesday , 15th November, 2017.